Other European leaders: No thanks. Ever since the Suez Crisis in 1956, Britain has struggled to establish a place in the world that fits its melancholic pretensions to its size and budget. Nostalgic about its former glory, anxious about its diminished state, and forgetful about its former crimes, Britain lives on its reputation with the same mixture of frugality and ostentatiousness that an elderly aristocrat might live on his trust fund—thriftily yet pompously, with a great sense of entitlement and precious little self-awareness. Britain lives on its reputation the way an elderly aristocrat might live on his trust fund—thriftily yet pompously. Central to this delusional patriotic sensibility has been Britain’s relationship with the United States. Fancying ourselves as the lone reliable conduit between Europe and America, British governments of either party long understood themselves as bilingual and transatlantic. Speaking the language both of American unilateral military power and pan-European ideals of social democracy and pooled sovereignty, we imagined our postcolonial role as the diplomatic bridge across the Atlantic. This in no small part explains the urgency with which British Prime Minister Theresa May pushed herself to the front of the queue to be the first foreign leader to meet Donald Trump after his inauguration. Most European dignitaries not only kept their distance but celebrated it: German Chancellor Angela Merkel used her first phone call to explain the Geneva Conventions to Trump after the unveiling of his refugee and Muslim travel ban. The Dutch government announced an international fund to finance access to birth control and abortion in developing countries to help compensate for the shortfall caused by Trump’s recent executive order reinstating the global gag rule, which blocks US funding to NGOs that provide abortion care or referrals. And Sweden’s deputy prime minister appeared to troll Trump—whose image signing that order in a room full of men looking on went viral—with a photograph of herself signing a climate bill surrounded only by female colleagues. Meanwhile, May—the United Kingdom’s second female prime minister—flew to Washington so that she could be photographed, all rictus smiles and fawning banter, walking hand in hand with the grabber in chief. The determination of “Theresa the Appeaser” to cozy up to Trump has galvanized resistance to her premiership. These overtures will fail on their own terms for four reasons—two long-standing and chronic, two more recent and currently in play. First, this “special relationship” was only ever really special for Britain. Were there a counseling service for spurned diplomatic suitors, the British foreign service would long ago have been warned of its American heartthrob: “He’s just not that into you.” While the United States finds British support for its actions useful, it is perfectly content to go it alone. As both the second Iraq War and the invasion of Grenada 20 years earlier testified, Britain has no power to restrain the United States from military force and folly. Its primary function is to enable; as such, it has always been in an abusive relationship—one in which the ultimate victims of that abuse were generally to be found in the developing world. Second, as a result of Britain’s ineffectual interventions, most European nations have never found it a particularly useful go-between with Washington. The European Union developed, at least in part, as a counterpoint to American hegemony, not as a junior partner in it. Finally, May is exhausting considerable domestic political capital at home to pursue this futile end. The day after Trump’s inauguration, London hosted one of the biggest women’s marches outside of the United States. 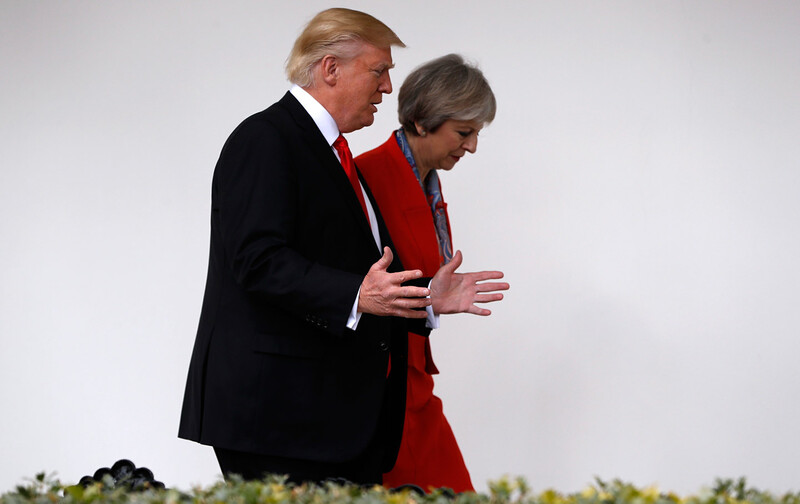 A little over a week later, a few days after May announced that she’d invited Trump on a state visit, tens of thousands of people were back in the streets, in London and in other major British cities, to protest his coming arrival and her craven acquiescence. Indeed, the determination of “Theresa the Appeaser” to cozy up to Trump has galvanized resistance to her premiership in a manner that her parliamentary opposition has been unable to do. It is, of course, easier to export frustration than deal with it on your doorstep. But the mood at these demonstrations suggests that Trump’s election is being understood as a huge, ugly orange canary in a coal mine fit to be condemned. The brazen bigotry that helped propel him to office and is now being enacted into law is by no means unique to the United States: It also made Brexit possible, and it’s fueling the election prospects of the hard right throughout Europe. Most European countries have their own version of Trump, while most major European cities have mounted their own significant demonstrations against Trump. These marches started off as acts of solidarity, but they have the potential to be much more.